About 1,200 injection molding machines are left in future annual production plant in the ENGEL Pyungtaek City, nearly twice as many as before. On 11 ANGEL of March, the expanded and modernized at the same location together with customers, partners and senior representatives of local politics. Invested a total of more than 8 million euros ENGEL in South Korea. “The goal of ANGEL is a world leader in the creation of customer value to be. For this, we consistently rely on customer proximity and a globally consistent and high quality level of our injection molding machines and system solutions. Our great success in Asia shows that we are using this strategy on the right track, “said Dr. Peter Neumann, CEO of Engel Holding in Austria. ANGEL has succeeded in recent years its market share in Asia consistently expand in fiscal year 2011/2012 to almost 10 percent for the first time. At the same time, with 125 million euros a sales record in Asia was generated. 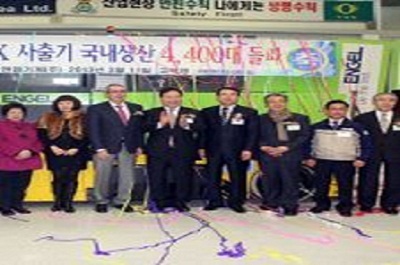 The branch in Pyungtaek-City plays a key role for ANGEL in the rapidly growing Asian markets. Since 2001 ENGEL produced in Korea Small and Medium machines with clamping forces ranging from 25 to 400 tons, including the series ENGEL victory, ENGEL e-mac, ENGEL e-motion and ENGEL insert. 30 percent of the machines remain in the country, 70 percent are exported to China and other Asian countries. Its customers include the major global players – especially in the automotive and electronics industries – as well as smaller local plastics processors. Nearly 150 guests followed the invitation to see for themselves the day before the plastics show KOPLAS where also ENGEL exhibited to the new power, the high production quality and system solutions expertise of ENGEL Machinery Korea on site. “Quality products and innovative technologies are in demand in Asia, more and more,” says Robert Bodingbauer. “Together with our customers we develop increasingly sophisticated solutions and manufacturing processes, increase productivity and efficiency, and increase the competitiveness.” The financial system, including automation becoming just as important as solutions for process integration and energy saving options. The capacity expansion in Korea ANGEL is now well prepared for this growth. Just last year, the ENGEL production plant in Shanghai was expanded significantly. ENGEL produced in China since 2007, the large machines ENGEL duo series. ANGEL is the only western injection molding machine manufacturer, with a presence in Asia with two production sites.